Cast spooky flickers of light. 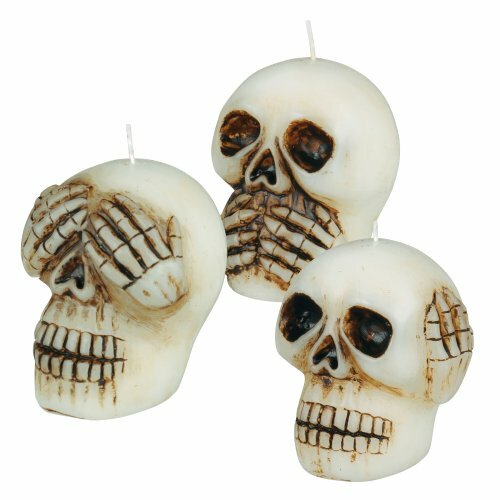 These Scull Candles are amusing and affordable essential. Each candle arrives cello wrapped with ribbon to ease your gift giving. Skulls stand 2 1/2 Inch tall and 1 3/4 Inch in diameter. Three of each style skulls as pictured are securely packaged into one box for shipping. Burn time is approximately 8 hours. Fun and simple way to decorate for Halloween season with these and other matching home decor items from Grasslands Road collection. View More In Nonstandard-Shaped Candles.